Thought T-Mobile was done with Uncarrier moves? No, you didn’t. We didn’t either. But still, we wanted you to be aware that they have more to announce on March 18. 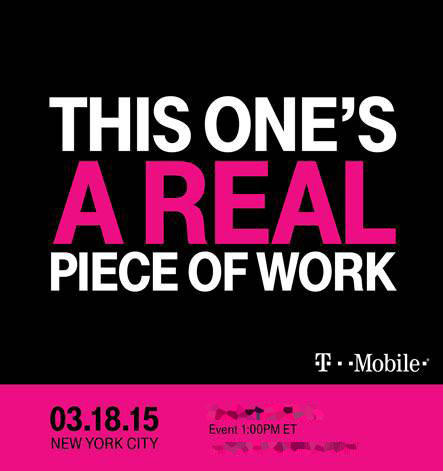 Through an invite received by us as we attempted to run out the door to the weekend, we know that T-Mobile has something in store that is “a real piece of work.” Well, it says specifically that “This One’s A Real Piece Of Work.” Is that in reference to the HTC One M9? The new HTC flagship is launching at the end of March, so it could be. I don’t know how that phone is Uncarrier-like, but maybe T-Mobile figured out a way to make it so. Or are we talking about business accounts and the work environment?